It operates on the principle, that a very slight upward pressure on the spindle at the contact point is multiplied through a system of gears and levers. It is indicated on the face of the dial by a dial finger. 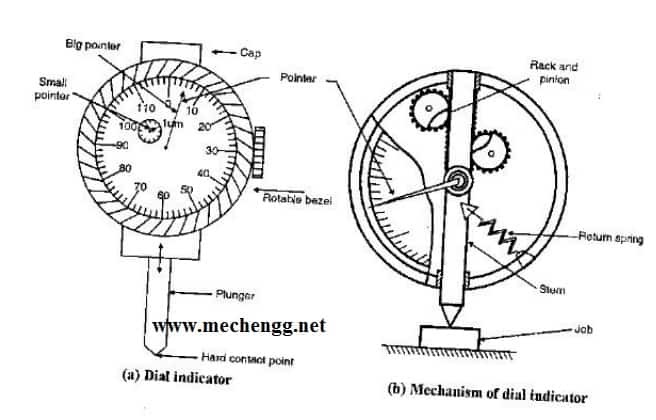 Dial indicators basically consists of a body with a round graduated dial and a contact point connected with a spiral or gear train so that hand on the dial face indicates the amount of movement of the contact point. They are designed for use on a wide range of standard measuring devices such as dial box gauges, portal dial, hand gauges, dial depth gauges, diameter gauges and dial indicator snap gauge. Corresponds to a spindle movement of 1 mm. The movement mechanism of the instrument is housed in a metal case for it’s protection. The large dial scale is graduated into 100 divisions. The indicator is set to zero by the use of slip gauges representing the basic size of part. 1. It should give trouble free and dependable readings over a long period. 2. The pressure required on measuring head to obtain zero reading must remain constant over the whole range. 3. The pointer should indicate the direction of movement of the measuring plunger. 5. The movement of the measuring plunger should be in either direction without affecting the accuracy. 6. The pointer movement should be damped, so that it will not oscillate when the readings are being taken. 1. Comparing two heights or distances between narrow limits. 2. To determine the errors in geometrical form such as ovality, roundness and taper. 3. For taking accurate measurement of deformation such as intension and compression. 4. To determine positional errors of surfaces such as parallelism, squareness and alignment. 5. To check the alignment of lathe centers by using suitable accurate bar between the centers. 6. To check trueness of milling machine arbours and to check the parallelism of shaper arm with table surface or vice. its easy more than my college.